Yesterday, an Ohio newspaper reported that the state’s urban schoolchildren are 3.3 times more likely to be hit by a car on their way to school than students in suburban districts. More than one out of every 500 children in the state’s eight largest urban districts had been hit by a car in the last five years. I was poking around Google Maps over the weekend when I stumbled on a Street View scene [above] that made me stop in my tracks. 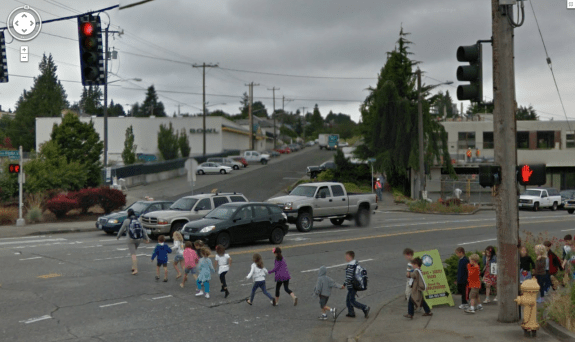 This group of kids, holding hands, escorted by two adults have to run to make sure they can get across the five lanes of Fauntleroy Way SW at SW Alaska Street in West Seattle. Why does our society accept a built environment that is inhospitable and dangerous to children? Elsewhere on the Network today: Streets.mn explains how American politics helps lead to bad infrastructure projects. Economics of Place shares a sprawl “cautionary tale.” And Greater Greater Washington shows how a new roundabout in Greenbelt, Maryland, incorporates bicycle access.